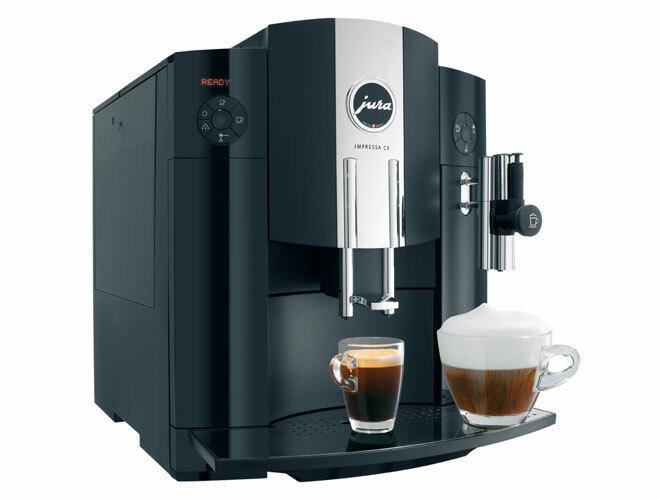 The IMPRESSA C9 is the most compact JURA automatic speciality coffee machine, and treats you to a perfect cappuccino at the touch of a button and without having to move the cup. The One Touch Cappuccino design makes this possible. A simple, logical operating syntax combined with a plain text display guides you directly to your personal coffee preferences. Plus pay by DEBIT CARD get an extra 500g bag of coffee! Oily Coffee Note: As with all bean to cup machines, they are not compatible with oily coffee, it can cause clogs in the grinder and jams in the brew chamber, only use non oily coffee and not caramlised beans. Avoid Italia Dark & Metropolis Espresso Coffee from our range. With its One Touch Cappuccino frother the IMPRESSA C9 makes your coffee dreams come true at the touch of a button without moving the cup. A plain text display, easily comprehensible symbols and the Rotary Switch make operation of the IMPRESSA C9 clear and simple. The coffee spout height can be conveniently varied between 65 and 111 mm to suit all cup sizes, for example espresso and coffee cups. The compact automatic speciality coffee machine also includes a 0.4 litre stainless steel vacuum milk container as a standard feature. The digital assistant LEO will teach you all about the Jura C9 One Touch. Get to know the machine before your buy!